No sooner did I hypothesize the eye had strengthened than we received a report from the Marco Island (circled) Emergency Operations Center (via NWS) of a 130 mph gust measured there. At left is the 3:05pm EDT reflectivity data which is the type of radar you routinely see on TV. At right is the Doppler (wind) data. The 130 mph gust is in the darkest brown area which is where you would expected it to be -- in the eyeball which is where the strongest winds in a hurricane are located. Extreme winds are now in the Naples area, moving slowly north. 3:10pm EDT. 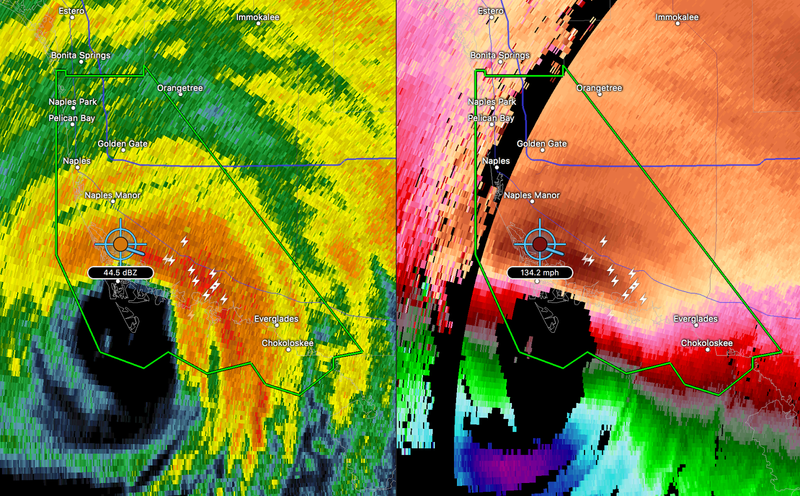 NWS has issued a flash flood EMERGENCY below for the area in green due to the extreme and rapidly growing storm surge. This is a life-threatening situation! 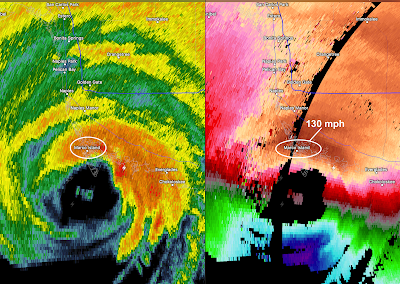 At 3:20pm, radar is measuring (right) 136 mph winds. See below (3:32p Eastern). Winds will increase in Naples.